Need an escape from cabin fever? Then enjoy an evening of spectacle and thrill, laughs and tears, of theatre! As one of the nation’s premier urban centers for the stage, Chicago is home to dozens of independent, storefront theatre companies, as well as the acclaimed Steppenwolf Theatre, the Goodman Theatre, and the Victory Gardens Theatre. These theatre productions range from slice-of-life Americana to the classic showmanship of musicals on the White Way. Here are a just a few selections made by Lawndale News. We hope you experience a memorable evening of art made alive. Thursdays-Saturday, 7:30 p.m., Sundays 3 p.m.
By master American dramatist Clifford Odets, Golden Boy is a powerful tale set in the gritty world of prize fighting. Prodigious violinist turned brutal boxer Joe Bonaparte defies his family and fame in this powerful meditation on the American dream. Barrel of Monkeys reimagines the stories of wild-eyed, charming, and unintentionally insightful children into bright and energetic live sketches for the whole family to love. 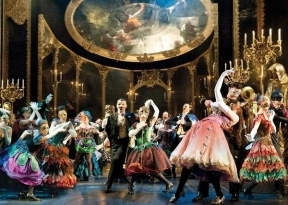 Tuesdays-Fridays 7:30 p.m., Saturdays 2 p.m., 8 p.m., Sundays 2 p.m.
Andrew Lloyd Webber’s phenomenal The Phantom of the Opera exemplifies the musical in top form. Following the life of ingenue’ Christine Daae, the gifted soprano must choose between her child love Rolph and the Phantom, a tortured figure hidden in dark shadows. It’s a rousing tale of tragic romance.